I finished reading the book this weekend and it was eye-opening. The book presents great challenges to the study of capital and inequalities in the developed economies as well as in the rest of the world. The book also opens the doors for a wider discussion on the effects European Capital has had in the global economy. Further, the book invites globalists to challenge our understanding of European-centric terms that over longer periods of time become, perhaps, insufficient to comprehend global economic processes over the passing of centuries and how these processes have changed and transformed themselves by a complex evolution and redefinition. It can’t be denied that capital during all of the 19th Century and in the beginning of the 20th Century was centered in the main European metropolises and extracted most of the goods from the periphery. Few Capital remained in colonies and protectorates. Wealth belonged to the Empires and Poverty remained in colonial territories. Even the poorest of the European was considered Rich by comparison to the inhabitants of Colonies. Today, European Empires are gone for a while, U.S. Capital increased and gained from the fall of the European Empires and new economies started developing in former Colonies. Giant Economies like China and Russia woke up after decades of isolation from global trade and today reconfigured our understanding of Capital. Piketty’s book somehow fails to explore this Global political changes and its economic effects. Piketty’s central argument has a gigantic weakness since it is tied to nation-states and cannot be compared or understood in reference to Global Capital flows in today’s multinational economy. Very few references are made to the role played by Multinational Companies and foreign national investments and savings by State Companies in the world. And less is mentioned of global inequalities and the North-South divide that has been increased by the investments done by Developed and Developing Economies in the rest of the world. Piketty argues that Capital has tended over time to grow faster than the overall economy (he focuses on European and US economies); and that income from capital is invariably much less evenly distributed than labor income (again he focuses on European and US economies). Thus failing to acknowledge how Labor income stopped been localized during the 20th Century and it involved multiple polities far away from the metropolis. Piketty argues that together (Capital growth and its uneven distribution) amount to a powerful force for increasing inequality. Piketty doesn’t take things as far as Marx and this is a pitty. Marx’s methodology involved the State but it also referenced to its effects both and from the peripheries through the pass of longer periods of time. This is one of the most important contributions of Marx: his global understand of the economy. 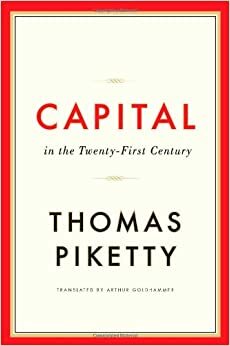 Piketty shows how over the two-plus centuries for which good records exist, the only major decline in capital’s economic share and in economic inequality was the result of World Wars I and II, which destroyed lots of capital and brought much higher taxes in the U.S. and Europe. However, he again fails to acknowledge how Capital grew in the Global South after these wars as a result of increased inequalities in the Colonies and Agriculture-centered States in South America and Asia. During the wars Capital destruction was followed by a spectacular run of economic growth that involved the entire globe and not only Europe and the U.S. The Cold War is a good reference for finding how Capital flows went from Europe to Asia, America and Africa. As well, the run of economic growth started involving non-State actors in which Capital continue increasing at a higher and faster rate than the one he references and studies. Failing to study this shows in Piketty’s book that after decades of peace, slowing growth, and declining tax rates, capital and inequality are on the rise all over the developed world only, and it’s not clear what if anything will alter that trajectory in the decades to come. However, the declining tax rates, capital and inequality are on the rise at a faster pace in the developing economies and in the “puppet states” (Nigeria, Chile, the Middle East countries) which have emerged around them as sources of petrol, minerals and rare earths. Piketty’s main worry as points out Justin Fox is that “growing wealth in Europe will bring a return to 19th century circumstances in which most affluent people get that way through inheritance.” Plus, “U.S. median income will continue lossing ground relative to other nations in the following years”. But this are not the only worries that we should identify. The BRICS countries are probably a good source of comparison to see how the growing wealth of the 20th Century remains on the hands of the few rich and is currently been passed through inheritance. Further, developing economies in South America and Africa are an extreme case of the last. Piketty’s solution to Europe’s and U.S. problems is that a progressive global wealth tax be established. But this tax will fail to be the best response to the current dynamics of inequality if Capital continues flowing outside of Europe into multinational capital investments overseas and into State companies overseas. I enjoyed this political economy analysis and will continue learning a lot from it. Piketty’s solution is a challenge for the study of global political economy and the reconfiguration of the global economy in the 21st Century. Perhaps if a new book is published studying the shareholders who own the most stock in almost every Fortune 500 company and the Capital of any major global company instead of only the economies of France, Germany or the United States more accurate insights will be found. One of my favourite museums is The Met and one of my favourite paintings is also there. I was just impressed and happy to see that a new video cured by the art historian and curator George Goldner depicted and explained that painting. The painting is titled” View of Toledo” by El Greco (Domenikos Theotokopoulos). I invite you to watch the video interview behind this painting and Goldner’s commentary. I am sure you will love it. Why is Copernicus relevant to our understanding of Globalization? We are constantly bombarded with media reports on globalization in terms of its increasing process and potential effects on our lives. What is meant by this concept and why should we be concerned with its impact? The developing countries of sub-Saharan Africa, Latin America and Asia should be interested in it because of the opportunities and threats offered by globalization (also known as globalisation). The mother of this globalization is Science and the activator is her daughter Technology (both affectionately called science and technology). The most visible manifestations of “globalization” are in the economic and communications spheres. And one of the fathers of Science is our friend Copernicus. Copernicus broke open the medieval idea of an enclosed, Earth-centered universe. He set the stage for all of modern astronomy. He lived at a time when people believed Earth lay enclosed within crystal spheres at the center of the universe. Can you picture the leap of imagination required for him to conceive of a sun-centered universe? The publication of Copernicus’ book – De revolutionibus orbium coelestium (On the Revolutions of the Celestial Spheres) – just before his death in 1543, set the stage for all of modern astronomy. Today, people speak of his work as the Copernican Revolution. Post-data: Copernicus wasn’t the first to conceive of a sun-centered universe. Early Greek philosophers also spoke of it. 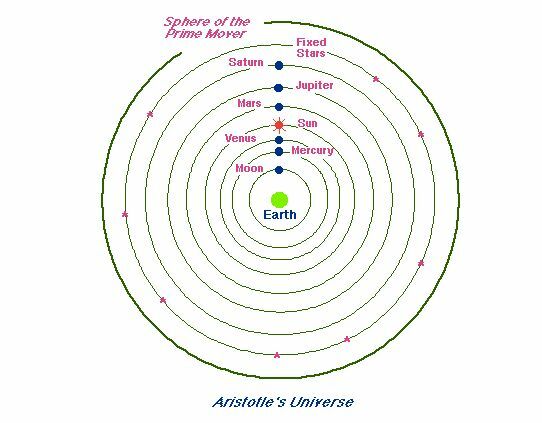 It was the Greek philosopher Aristotle, however, who proposed that the heavens were literally composed of 55 concentric, crystalline spheres to which the celestial objects were attached. In Aristole’s model, Earth lay at the center of these spheres. Thus Earth lay – fixed and enclosed – until Copernicus published his version of a heliocentric universe. Napoleon I, originally Napolean Bonaparte, was the emperor of France. He seized power in 1799 in a coup d’etat, crowned himself emperor in 1804, and attempted to conquer Europe. He abdicated in 1815 after several military defeats. Je connais quelqu’un qui a plus d’esprit que Napoléon, que Voltaire, que tous les ministres présents et futurs: c’est l’opinion. I know where there is more wisdom than is found in Napoleon, Voltaire, or all the ministers present and to come — in public opinion. Charles Maurice de Talleyrand was born a day like today on February 13, 1754. He is one of the smartest and more prolific politicians and diplomats of modern times (and one of my favourites). Born and well educated in the arts, letters and ideas into an aristocratic family in Paris he quickly became a wise men by a young age. 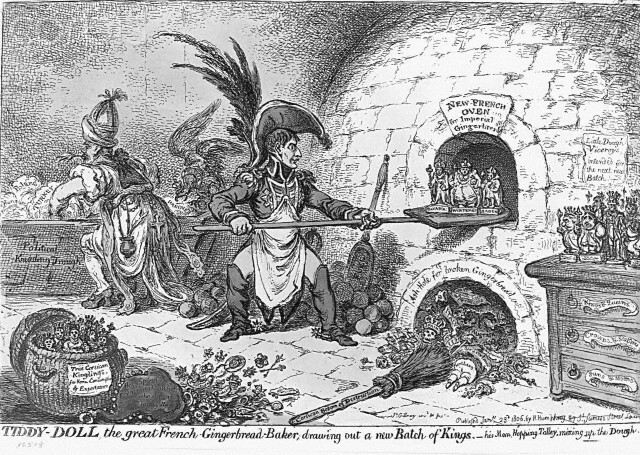 He worked, survived and taught successfully for and against the regimes of Louis XVI, participated actively through the French Revolution and then under Napoleon I, Louis XVIII, Charles X, and Louis-Philippe. Talleyrand was, without a doubt, one of the most remarkable figures in the history of the late eighteenth and early nineteenth century, and certainly one of the most controversial. He was one of a rare breed capable of occupying a wide range of positions in politics and society, both in his public and private life. To a certain extent, he was representative of his era, whether taking on the mantel of the Ancien Régime, as an aristocrat working for the Revolution, or as lord of the Château de Valençay during the Restoration. However, it is the most important of these roles, Minister of Foreign Affairs during the Directoire, the Consulate, the Empire and the Restoration, for which he is of course remembered. A day like today in February 07 1898 the Émile Zola was brought to trial for libel for publishing J’Accuse in the L’Aurore a literary, liberal, and socialist newspaper published in Paris, France J’accuse is in my opinion one of the most important historical essays ever written because it brought to public opinion an honest and objective critic against the ruling elite’s injustices. Zola’s intention was that he be prosecuted for libel so that the new evidence in support of Dreyfus would be made public (“Correspondence Between Emile Zola and Imprisoned Alfred Dreyfus”. Shapell Manuscript Foundation.) The case divided France deeply between the reactionary army and church and the more liberal commercial society and its ramifications continued for many years. On the 100th anniversary of Zola’s article, France’s Roman Catholic daily paper, La Croix, apologized for its antisemitic editorials during the Dreyfus Affair. As Zola was a leading French thinker, his letter formed a major turning-point in the affair. And it is to you, Mr. President, that I will proclaim it, this truth, with all the force of the revulsion of an honest man. For your honor, I am convinced that you are unaware of it. And with whom will I thus denounce the criminal foundation of these guilty truths, if not with you, the first magistrate of the country? And by doing this, he requested the President to be truthful to Justice. Lets have this letter as a memory of which is our truthful right and obligation as citizens of our States. Let us remember that We MUST always Accuse the wrongdoers and Demand justice to prevail. “Selektion” on the Judenrampe, Auschwitz, May/June 1944. To be sent to the right meant slave labor; to the left, the gas chamber. This image shows the arrival of Hungarian Jews from Carpatho-Ruthenia, many of them from the Berehov ghetto. The photographer was Ernst Hofmann or Bernhard Walter of the SS. Image by Yad Vashem. Tribute to holocaust victims – We shall never forget!